Improper cooling of food can allow bacteria to grow an be a cause of food illness. Cold or hot holding of food is a critical control point – or a point at which maintaining proper temperatures will help ensure food is safe to eat. Cooks must know the proper temperature for holding food, monitor the holding process, and record temperatures of foods during holding. One of the leading causes of foodborne illness is the failure to properly cool foods. When cooking food that is not served immediately, it is important to get the food out of the bacteria temperature danger zone quickly. 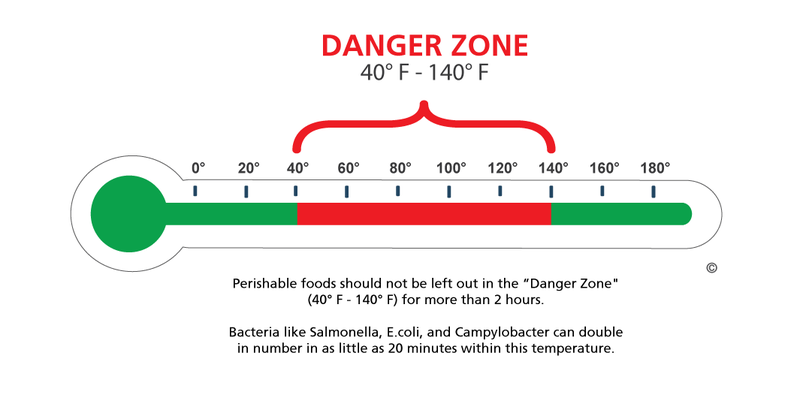 The bacteria danger zone is the temperature between 40°F -140°F where pathogens grow most quickly. 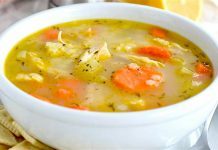 Note: Initial 2-hour Cool is Critical – The initial 2-hour cool is the most critical time period since the food is passing through the temperature range that supports the most rapid microorganism growth. If food has not reached 70°F within 2 hours, it must be reheated to 165°F for 15 seconds, and then cooled again or thrown away. When prepping a large batch of hot food, plan ahead for the cooling method you plan to use. Begin your plan by having an accurate food thermometer to keep tabs on the temperature during the cooling process. Use ice water bath – An ice water bath is effective for cooling. This method helps decrease the food temperature quickly and safely. Place the kettle of hot food into the ice bath. Stir the food to release heat and aid cooling. Don’t leave a large pot of hot food on the counter to cool before placing in the fridge. 3. Use ice in the recipe – You can reduce cooling time by adapting your food recipe. 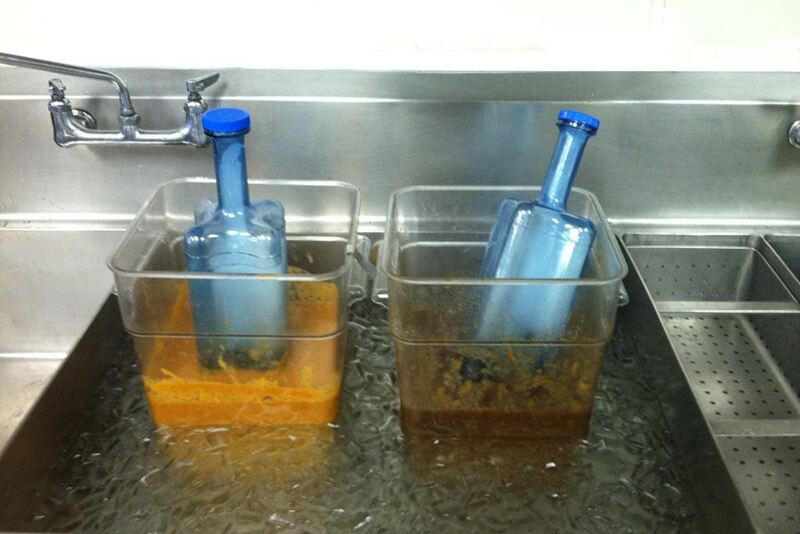 Prepare a thicker amount of food, reducing the original amount of water or liquid called for in the recipe. Add ice to the food at the final preparation step. Stir the hot food, in the kettle with the frozen chill paddle. Because cooling food is generally an out of sight, out of mind process, using a time/temperature log will help to keep employees and yourself aware that food is in the cooling process. 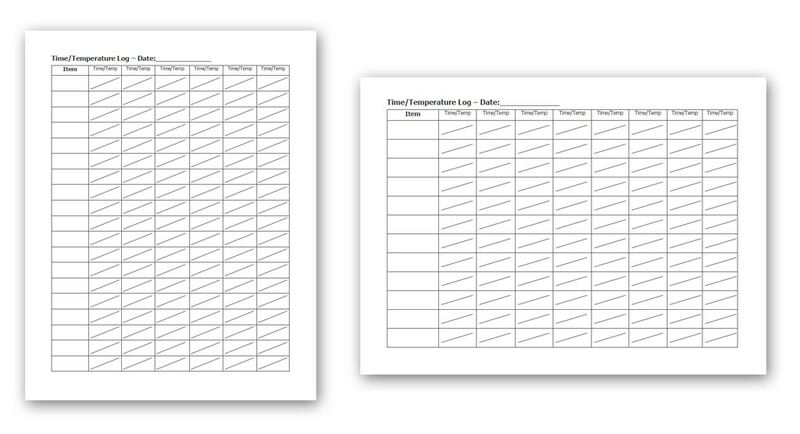 Log forms are a useful tool and can be utilized for cooling foods as well as other food items (hot holding, cold holding, storage) and refrigerators. You can print out a log form by clicking on the link found at the bottom this page. These logs will allow you to chart the effectiveness of your cooling procedures and if needed to make changes to keep your food safe. 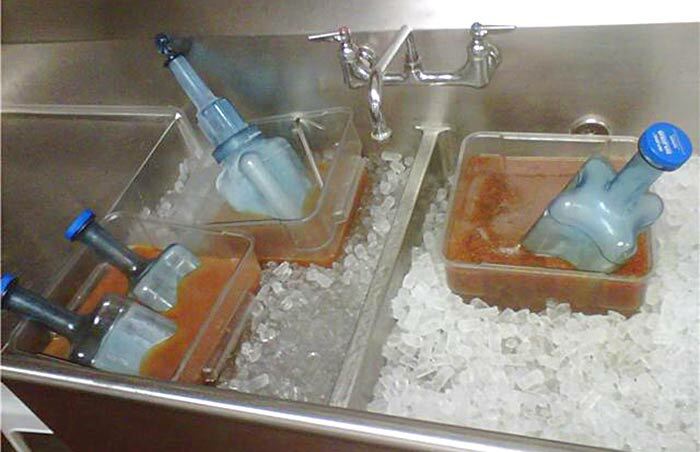 The temperature log charts below offer food service workers a simple way to monitor and record hot and cold holding temperatures in their establishment.